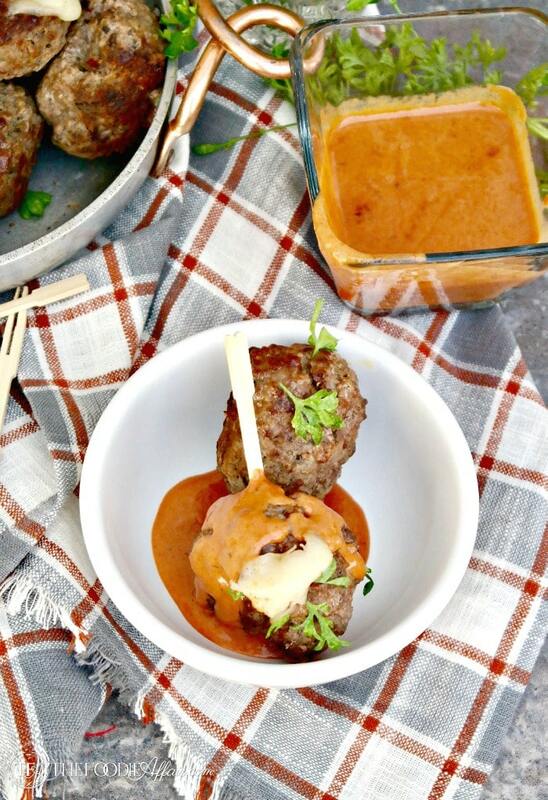 Cheese Stuffed Meatballs with a creamy tomato sauce makes a great appetizer or serve without the sauce on your favorite pasta! I thought I would share these meatballs before the big game this past weekend, but that obviously didn’t happen! My week got off schedule when I went to a play in Santa Cruz during the week. or searching the internet for supplies needed for our bathroom renovation! Renovating a bathroom could be a full-time job! Seriously. There are so many decisions to be made. From the style and type of metal of the fixtures to the size of tile – 12 x12″ or 12 x 24″, ceramic, porcelain or natural stone? The decisions are endless and permanent since it’s not like changing the color of the walls with paint! So it was nice to change my routine and check out our local talent. I’m always so impressed with the details of a play. It is so entertaining and goes by so quickly, but there are so many hours of practice for the stage crew and actors. I hope to check out more local plays through out the year. It feels so great to do something totally different! That was a very long story to why you didn’t get this recipe before the Superbowl festivities. 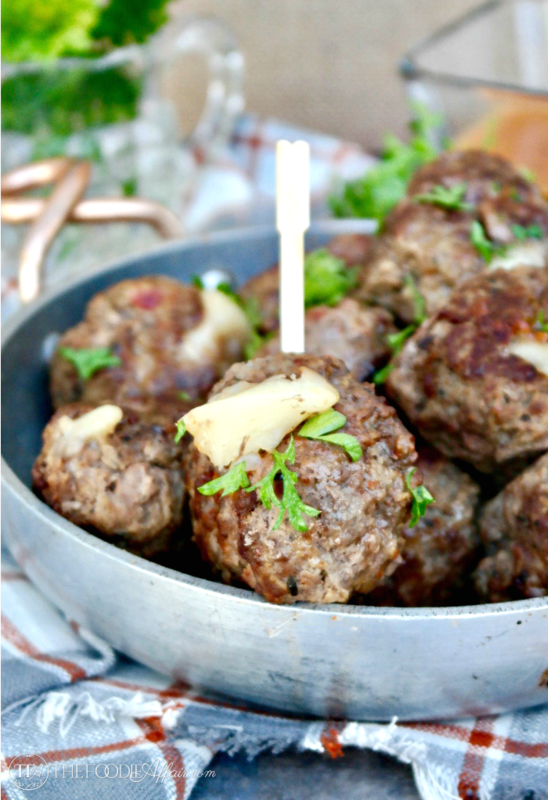 These meatballs are perfect for sharing with a crowd as an appetizer for anytime! They’re filling though, so they make a nice main dish too! These are served with a creamy tomato based sauce that’s rich and delicious, but you could also serve them with this Meaty Crockpot Pasta Sauce over spaghetti. Each batch makes about 10-11 meatballs that are about 3 inches in size. Super hearty and the cheesy filling is delicious! The ingredients are super simple in this recipe. Dried Basil, an egg, mozzarella cheese and salt and pepper! First you make mini patties, then you place a slice of cheese in the middle of the patty, You can use chunks of mozzarella cheese or slice up string cheese in fourths like I did. Gently form the meatballs covering the cheese and there you have a cheesy meatball ready to be cooked! You can bake these at 400 degrees for about 20 minutes or fry them up with some butter and oil! You’ll love the creamy tomato sauce – dig in! In a large bowl mix together beef, egg, basil, salt and pepper. Form 10-11 patties about 3 inches in diameter. 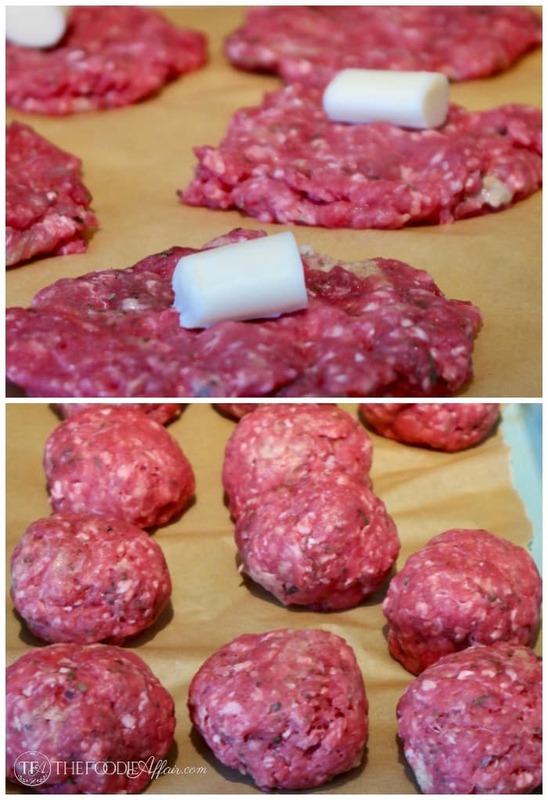 Place a slice of cheese in the middle and form meatballs. In a large skillet over medium heat add oil and butter. Add meatballs and cook turning every couple of minutes until each side is browned and the juice runs clear. Remove meatballs and place on a serving plate. In the same skillet add whipping cream and tomato paste heat over medium heat until large bubbles form. Season to taste and serve with meatballs. 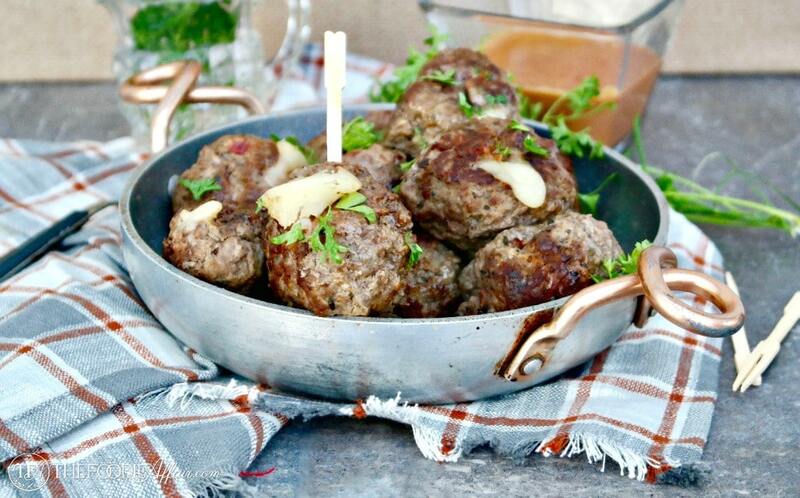 Adapted from Diet Doctor, Mozzarella-Stuffed Meatballs. Wow! This looks really delicious! Pinned and putting it on my dinner menu this next week! Oh, wow! These look great! All 5 of us would love these!!! Now this is serious comfort food in my opinion! That sauce looks incredible, and you really can’t go wrong with cheese stuffed anything! Good luck with renovating and thank you for the meat balls recipe ! These meatballs look great! And that tomato sauce – yummers! And so easy! I love this whole meal. And so will my family. There’s simply no reason every meatball isn’t stuffed with cheesy goodness! YUM! Just pinned as the boys are going to love this recipe. Very fun dipping sauce too. Low carb and loving it! Sound delicious, especially with your cream sauce. They look amazing. I love the cheesy surprise in the middle. I’m sorry…what? A CHEESE STUFFED MEATBALL? I’ll take 15! They look so good! 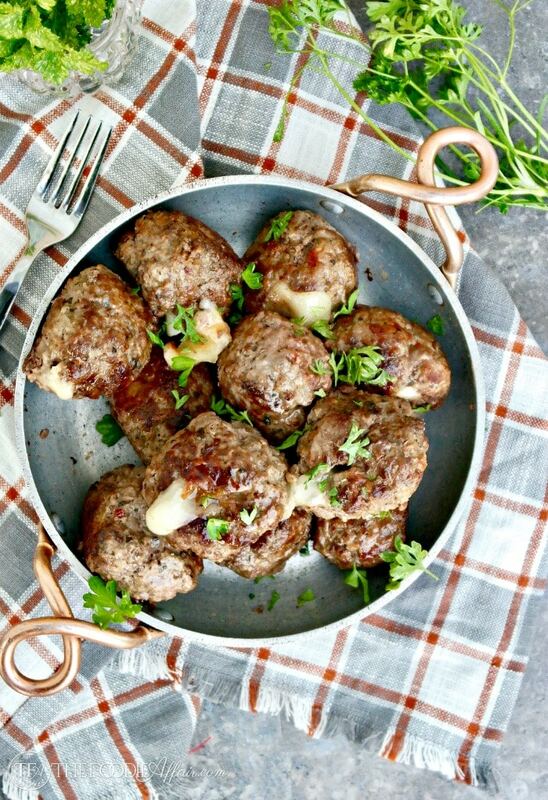 These meatballs look amazing! I can’t wait to give them a try! These meatballs look incredible and certainly more enjoyable to make an eat than renovating a new bathroom! I’m sure the new bathroom turned out beautifully but I would love just one of these savory and gooey meatballs! Beautiful job as always!! 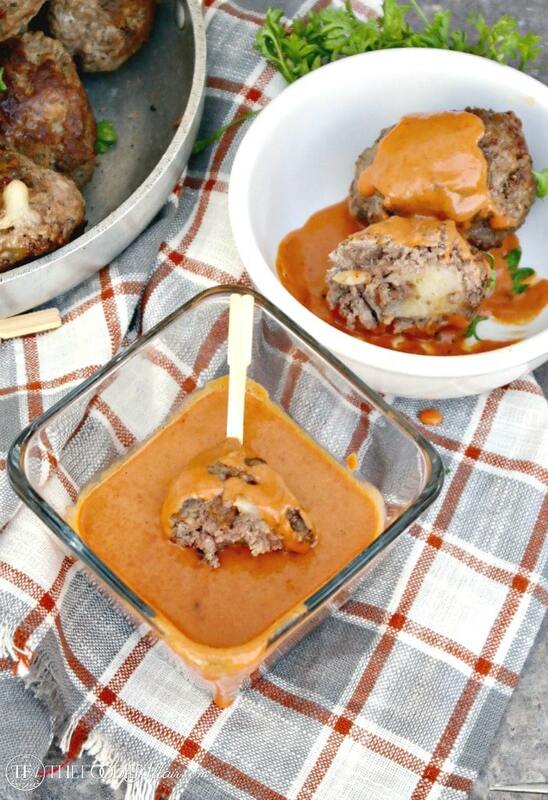 Cheese stuffed meatballs?!?! I need to make these asap!! The tomato sauce sounds so flavorful! Thanks for a great family friendly recipe! I have never tried to put cheese inside a meatball!! LIFE CHANGING!! CAn’t wait to try these — AND that creamy sauce!! I didn’t think that you could make meatballs any better than they already are but then you go and add cheese to the center! WOW! I love surprises in my meatballs totally loving the cheese add-in….. and I can totally relate, Ive been working or researching kitchen appliances for our new kitchen! You had me at cheese stuffed! This has to be the ultimate meatball recipe! 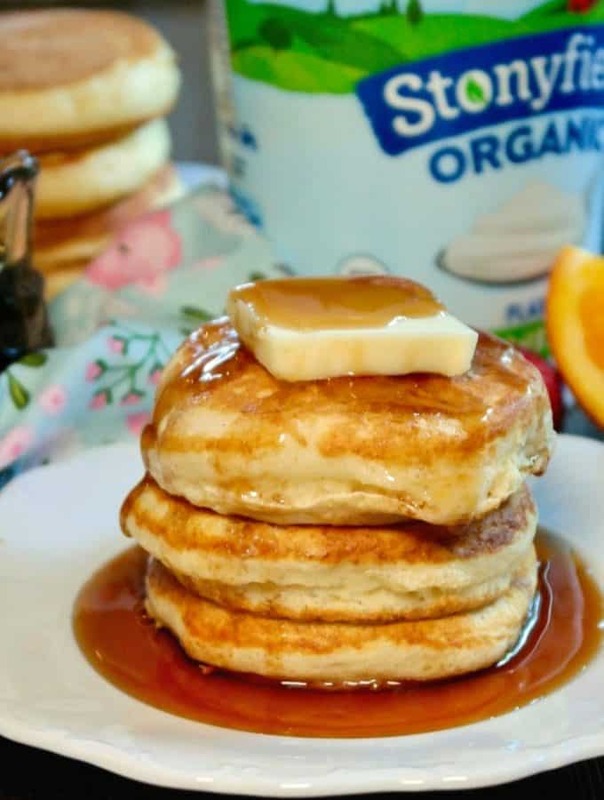 Fluffy pancake recipe silver dollar size made with yogurt. Top with syrup or enjoy with an egg and bacon sandwich style.